The cups are great, they work, are hard to break. Do what they bought them to do, and they've given me something to do for 6 years and become a Team USA athlete, so thank you. I got into speed stacking when I was in the 5th grade, I am now a sophomore in college. I LOVED cup stacking and wish I still had time for it. I bought four set of cupstacks like these and they were VERY durable, I still have them today in great condition. These speed stacks are amazing, my son loves them already. I heard about speed stacks from my teacher and I begged my parents to get them for me. Finally on this Christmas I did! They are so amazing and cool. My dugther has being dreaming about having speed stacking cups. She loved it . I got two sets of these cups and there great! for any level. beginner or pro. get these cups!!!! I give these cups a 5/5 because the quality is amazing and the speed is great but not as fast as other sets overall good cups. i begged my mother to get these when they were on sale and she did????!! My gym teacher introduced them to me and i was really excited and now mine are on their way. My son did cup stacking in physical education and loved it! My daughter tried it in PE and she loves it. Can't wait to get her set. My kids did this at school and have really wanted us to purchase some so they can do it at home. These cups are awesome in every way, from customization to the way they feel and stack. I am a speedcuber with a PB of 24 seconds on 3x3, and these are much easier, and just as much fun. (Just not as impressive). If you are looking for a cheap, fun, impressive hobby that you can do anywhere there is a table, then I highly recommend trying speed stacks! My child has spoke about these stackers from Gym class thought I would try them for him and his little brother for xmas. I am ready to see what these Sets are all about. My son has begged me since 2nd grade for these. He is very excited when they Speed Stack at school. I am glad my nine year old son will be given the opportunity to use this. He looks forward to it. I guess I can\'t compare them to anything else because they are my only cups, Got them on July 3rd and it is July 12th now, so 9 days, and my records are 3-3-3: 4.421. 3-6-3: 5.203. Cycle: 14.568. Good cups. First introduced by school. I have been speed stacking for 11 months and these cups are the best!!! I have set so many personal records with them!! I would rate them 6 out of 5 stars!!! Stacking cups are really fun to do. The first time I played with it ,I never wanted to stop. YAYYYYYY! SO FUN!!! SO DURABLE!!!! EASY!!! MY RECORD IS 5.82 ON THE CYCLE AND 3-3-3 IS 2.96!!!! great fun, tried at school. I just started and I love it !!! I have been cup stacking with these cups since kindergarten and i'm still cup stacking now! These are the best and fastest cups to use in a race. I first started watching stacking videos after coming across Rachel(aka OMG Girl's)videos. I've been stacking for almost 2 months now,with my record going from 37.56 to 11.21.The speed stacks I got(although they're from EBay)always come through for me.Keep up the good work! I just started Speed Stacking and it's awesome. The cups are great. Definitely get them, they're totally worth it. They are so cool at school just stacking and hecka people come to watch because they are really bright and cool!!! I love speed stacking and I love all the different colors. I love the fact of how they are unique but I have ONE wish. Would you please make it so that the stack fast DVD is optional? I have about 19 dvd's and I think that is plenty for me! Thanks, speed stacks are great and I love them so but if you could acknowledge my wish I would be very thankful. I got the pro cups and they were awsome. Speed Stacks are really entertaining well especially for my son, I as well like them, they're a lot more fun when my son plays them with his friends. He also really likes all the varieties of colors and sizes. Also the timer that tests them to beat someones record. We find them very delightful. At my school, we're doing cup stacking and i've gotten really good at it!! I really want to keep cup stacking for the rest of my life!!!! Every November my speed stack banner goes up in the school gym and hallway, the excitement that creates with all my students is unbelievable! Students at Stanwood Elementary are speed stack crazy! Any color will satisfy them, just give them a table with a mat and stacks on it and away they "stack"! Many of my stacks are multicolored due to heavy use 5 days a week - thank you for the free replacements! I have been coaching and teaching sport stacking for over 10 years. Physical Education and other sports for over 35 years. 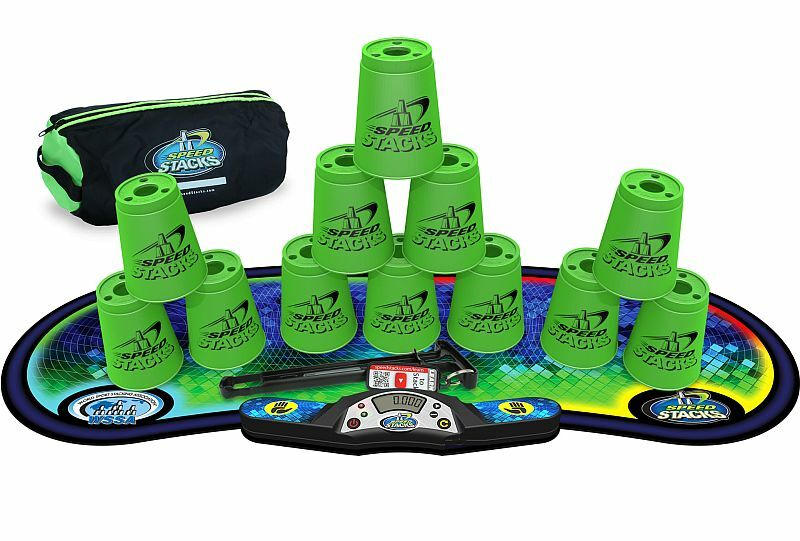 Used the very first cups before speed stacks developed and improved the current standard of equipment. I am a believer in "sport stacking" for kids. I have watched students of various academic levels and abilities, physically and mentally improve their social, emotional, academic, physical and over-all individuality. My students have competed in inner school clubs, district, state, and regional competition. I also organized/directed the first Illinois State Championship. This is an activity that I can say reaches across "EVERY" level of the curriculum and leaves no one out. I have seen students blossomed into outstanding students who have given sport stacking the credit for their positive development in high school.and college (My daughter included-now a pharmacy student). Parents absolutely love it. My clubs average 200 students every year with a waiting list, just to get involved. If your school is not doing this, they definitely should give it a try. Very easy to get started. I started with these cups when i was 4. They are in good shape and i am 15 now and i am on team U.S.A and my record is 5.78 . I think these are great cups! these are so good i have been stacking for about 4 months and my record for the cycle is 8.56 . i have blues which are good and i have clear pro series which = AMAZING i wanna buy the purples and pinks as well as the orange pretty much all of them. I have been stacking for 7 months now and my record is 9.17 for the cycle! I got the blue set and it rocks! I will definitely buy them again. I have been stacking for about a year and THESE CUPS ARE AWESOME!!! I have Glow-in-the-dark Green and Glow-in-the-dark Blue. My record is about 9:52, and I'm definitely going to buy more cups! I first got into sport stacking at school and got my first set soon after. The instructional DVD definately helped and now I have been stacking for 4 years and even got on Team usa. Thanks speed stacks! These cups are very nice and do not break easily, which is good because they fall on the floor a lot. Also, I enjoy cup stacking and this helps me play piano. These are the best way to have fun and good for the whole family! These are awesome, i have been cup stacking for about 2 years and have really improved. Speed stacks is fun and healthy! I love speed stacks! I hold the state record in wisconsin for the cycle stack. Ive been practicing since i was six and it paid off. I have three sets of cups. Great and fun but a bit expensive. Love speed Stacking. I just wish they would bring some of the older colors like camo. And they should make the Stackpod again! These speed stacks are so cheap and good. When I bought them from Ebay It was really expensive. I think this is a great way to improve typing and playing piano. Thank you speedstacks.com!! we do these in pe sometime and i absolutely love them! i might buy some but maybe not just cuz their very very very pricey and hard to afford for a kid. but other than that i love them! My son has had a wonderful time playing and stacking these cups. He plays with these as part of our school's PE curriculum, so I decided to buy a set for him to have at home. I thought they were a little expensive but they seem real durable and it does come with a dvd so price might be reasonable after all. These used to be sold in local stores such as Walmart and Target but now can only be found online. This is a little disappointing since sometimes Grandma might like to buy a set and does not have enough computer knowledge to find them online. Otherwise, it is a wonderful toy for any child. Great toy for hand eye coordination. My 5 year old just loves these and is learning how to do most of the tricks as they are not hard to do and it is fun to see her have immediate success. When I saw this was on both my niece and nephews wish list I thought what a waste of money, just get some dixie cups and they would be set. I was told "no, they need the real deal and only the official stacking cups would do". So I bit the bullet and bout two sets. Turns out these were a hit! This is actually would it took to elevate social status! When I saw how fast they could stack and how much joy it brought I was so glad I made the purchase. As my nephew said "don't skimp the other kids will laugh at us" I am glad I bought these as they have gotten hours and hours of enjoyment out of them. I couldn't find this anywhere in stores. My niece had been asking for it for a year and her dad gave up. I got this for her birthday tomorrow. It's perfect. As a parent at 40yrs old of 5 and 10yr old I am not sure why they like this so much but they do!!! The kids in neighborhood all enjoy as well! We purhcased 2 of these sets and wish I would have purchased for birthday gifts for neighborhood kids! I watched youtube videos of people doing speed stacks, and I felt curious about it. In my country nobody practices it. I found that it's fun and it's addictive, you try to do faster than before. Sometimes it's difficult because I have found that some people is annoyed by the sound of the cups, son I need to wait for the right moment to play. Nevertheless, it's fun and it trains your eye-hands coordination. I got this for my seven year old charge. She loves to play with it all day. It is even fun for her two older sisters and the three adults in our home. It is durable and well made. The only complaint is that it is hard to get back into the netted bag that comes with it. IT IS A GREAT PRODUCT.IT KEEPS MY DAUGHTER BUSY FOR HOURS. IT WAS WORTH BUYING THIS TOY. IT ALSO HELPED MY DAUGHTER WIN HER COMPETITION AT SCHOOL. Great purchase. My son's school has an annual contest with Speed Stacks for each grade. I bought them so he could practice and have fun. He really likes it toy. He finds it fun to perform in front of others to show how fast he can do this. The kids are having a ball trying to beat each other's time. Plus their dexterity is improving and the contests at school are even more fun. Kind of gives them an advantage during competitions. We purchased replacement cups for this game because we love the game so much. One of the original cups cracked and that really affected the ability to play the game. The replacement cup were almost half the cost of the original game... too expensive! I bought these cups for my 7yr old for Christmas and she absolutely loved it. My 10yr old wanted them so I bought her a set along with a stack mat for each and also a set of mini stacks for each with the timer and they love competeing with each other. Great product to develop better hand eye coordination. Loads of fun for all!! Love this toy. Was delivered fast and exactly what the description described. My daughter plays with it all the time. My son (11) has played this game several times over the last couple years at school nights with a "math theme". I decided to track it down for him over the holidays and he loves it. My kid hasn't played with the cups, but I am excited and feel she will enjoy them very much. Her school has competitions and she now can practice at home for them. I purchased these for my son as a replacemet set. He loves to stack them and has become quite good at it over the years. My only complaint would be that these didn't come in a box or anything. They came in a plastic bag. Normally not a problem but I was giving these to him for his birthday and you can't really wrap them in paper so you would need a gift bag. Delivery was on time and my kiddo enjoys them. The belt clip comes in handy to keep up with them when at a competition. This is a wonderful gift for grandchildren. I've purchased for granddaughters and bought one for my 'grandma's toy closet!' Excellent quality and lots of fun! AND, no batteries!! I ordered the stacking cups on a whim, for my ten year old daughter that does everything in high gear. We were having issues with hurried assignments at school, which resulted in poor penmanship, sloppy work, and ultimately low marks. Speed Stackers have provided an outlet for this need to finish first. Speed stacking requires you to be the fastest! She loves them! As a result, I have seen improvements all the way across the board at school. We would reccomend them to anyone! This toy is really great for children with autism. It works on hand eye coordination. Children with autism like the structure of the activity and repeating the activity. Great! I got this for my 10 year old son who typically is on his PSP as much as he can be. Since getting this, all he wants to do is STACK! The DVD is a must, because it shows proper technique. I bought this item for my 11 year old son for Christmas. I was amazed at how fast he could stack and un-stack these cups. Him and my daughter (age 15) have competitions to see who can stack the fastest. It is a really great game to improve hand eye coordination.